India's agriculture production may be impacted this year if a likely El Nino torpedoes monsoon rainfall. NEW DELHI: After three years of bumper crop harvest, India’s agriculture production may be impacted this year if a likely El Nino torpedoes monsoon rainfall, putting pressure on food prices, the Economic Survey said today. With the Met Department predicting 71 per cent probability of a sub-normal or deficient monsoon and spatial distribution of rainfall, the pre-Budget document said, agriculture output is likely to be impacted and consequently food prices. There are concerns about the likely occurrence of the El Nino, when surface temperatures in the Pacific Ocean rise above average for several months which adversely affects weather in many regions, it said. 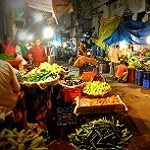 “This is likely to have an impact on India’s agriculture and consequently on food prices,” the survey said. However, it added that there appears to be “no cause for alarm on the El Nino impact” as the country is well placed on foodgrains availability with record domestic production and huge stocks in the central pool. The Met Department has projected below normal monsoon at 93 per cent of the long period average for this year. Till June, rainfall is deficient by 43 per cent. As a result, sowing has been delayed and the total area under kharif crops is also lower by 43 per cent at 182.4 lakh hectares till July 4. Noting that Indian agriculture has become more robust over the last decade with record output of foodgrains and oilseeds, the survey suggested that increasing the efficiency of the farm-to-fork value chain is crucial for eliminating poverty and malnutrition. The survey listed the major challenges faced by the Indian agriculture sector that included low productivity levels, soil degradation and market distortions that prevent the creation of a national common market and phased shifting to direct transfer of fertiliser-food subsidies. “A shift to direct cash transfer system or food stamps would anchor our food policy to the requirement of people and would additionally reduce the fiscal deficit,” it suggested. Strengthening the agriculture sector is crucial for poverty alleviation, ensuring food security, increasing employment opportunities and enhancing rural incomes, it added.